Peter H. Gleick’s “Freshwater Use” [Solutions to Environmental Threats] neglected to mention one obvious water-conservation measure: meter all freshwater and charge for it. Why should some—most notably agribusiness—receive this valuable resource for free? It is already the policy in some countries to assume that all freshwater is the property of the federal government, owned by all citizens equally. If we were to adopt such a policy in the U.S., we could use the money so collected to install free low-flow toilets, showerheads, and so on in all public housing. It could also be used to partially underwrite farmers converting to drip irrigation and soil-moisture sensors, perhaps in exchange for a promise not to raise food prices as a result of increased irrigation costs. Making everyone pay for what they actually use is always good policy: the profit motive encourages conservation. I am both saddened and dismayed that, once again, you devote the better part of an issue to the problems of sustainability while barely mentioning the root cause of most of the threats to our world: population growth. While I concur with the steps you outline to address biodiversity loss, ocean acidification, climate change, and the like, these are but symptoms of the underlying problem. Ultimately, no technological solution can succeed without tackling the issue of demand. As long as the world’s population continues to grow, the incessant pressure for more land, more food and more energy will continue, dwarfing any gains to be had through conservation and technology. Modern medicine and modern fertilizers have triggered the population explosion of the past 200 years, but the human drive to procreate hasn’t adjusted to the realities of the modern world. We as a species must voluntarily act to reduce our population to sustainable levels, or else Mother Nature will almost certainly do it for us through war, famine and disease. Increased funding for family planning, tax laws that discourage multiple children, and a shift away from a growth-based economy (which depends in part on an increasing population) must be part of any plan for a sustainable future. Jonathan Foley’s otherwise excellent “Boundaries for a Healthy Planet” falls short, in my view, in one very important respect. In his introduction he mentions the growth of population and of consumption, saying this has expanded to a global assault and observing that we live in a full world. Yet the rest of the article is confined to discussing ways of limiting the consequences of this growth, without any consideration of limiting growth itself. But should not population itself be subject to a threshold? The world’s population continues to grow at more than 360,000 a day. The most often quoted figure of nine billion in 2050 is generally quoted uncritically, but this figure, now updated to 9.2 billion, is only the middle of three projections by the United Nations Population Fund; the actual figure could be as high as 10.5 billion. This will affect for the worse all the other environmental processes identified in the article, especially freshwater, land use and biodiversity. 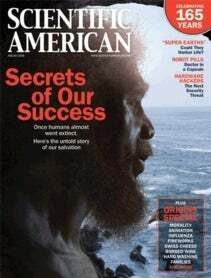 A recent article in a special issue of Scientific American [“Population & Sustainability,” by Robert Engelman; Scientific American Earth 3.0, June 2009] pointed out that the number of unintended pregnancies is almost the same as the number by which population increases, so it should be possible to address the problem of population increase in a wholly noncoercive way. Moreover, according to the U.N. Population Fund, 200 million women would use family planning but have no access to it. As a result, according to the World Health Organization, 20 million women undergo unsafe abortions with a horrifying death toll as a consequence. Therefore, there is clearly a huge unfulfilled demand for family planning. I did not think I would live long enough to read an article dealing with the subject matter in “Breaking the Growth Habit,” by Bill McKibben. During my 72 years as a citizen of the U.S., I’ve lived out West, back East, up North and down South. There was always a local chamber of commerce stating that if a town was not in a perpetual state of growth, it was not healthy. Isn’t growth for the sake of growth the philosophy of cancer? Much of what McKibben writes is silly. The idea of completely stopping economic growth is not only crazy but in one fell swoop dooms the couple of billion people living below the poverty level on Earth, as well as their descendants, to bare subsistence living for eternity. That is not only nuts, it is morally indefensible. His ideas on local agriculture are also way off track. I happen to have lived in a rural community before “industrial farming” existed. I remember the lean diet we had during winter: root vegetables, cabbage as the only salad, canned beans and tomatoes, etcetera, but no fresh green vegetables at all. I do not want to go back to that, nor do I need to. I like having fresh Chilean blueberries available in midwinter, crisp lettuce all year long as well as a cornucopia of other fresh, healthy produce. If McKibben wants to revert back to the lean old days, fine—but do not preach it to me! As an investigator, I appreciate how Thomas R. Insel’s “Faulty Circuits” ends with a few comments regarding the transition taking place in psychiatry from a subjective, mental-based discipline to one thoroughly grounded in neuroscience. The intrinsic Cartesian dualist bias that has for so long restrained psychiatry may at long last be loosening its grasp, thus allowing psychiatry to join the other medical specialties, thoroughly grounded in sound scientific practice.